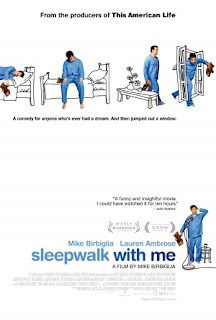 Stand-up comedian Matt Pandamiglio (Mike Birbiglia) has a sleep disorder in which he acts out his dreams. Sometimes this is fairly harmless, even comical. On other occasions it can result in him doing things like jumping through a hotel room window. It isn't until the latter that Matt decides that maybe he ought to seek treatment for his condition. Part of SLEEPWALK WITH ME tells the story of how Mike finally reached that point. Just as importantly the film also shows how Matt goes from being a fourth or firth rate comedian at best to getting in touch with his inner comic voice and finding success, and how all of this affects his relationship with girlfriend Abby (Lauren Ambrose). 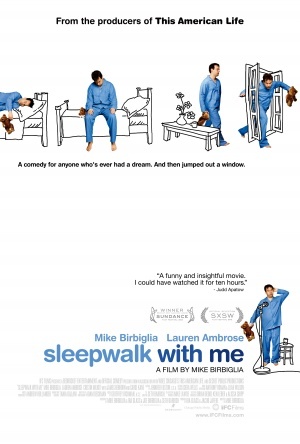 Evidently most of what happens in SLEEPWALK WITH ME actually did happen to Birbiglia. He turned his experiences into a one man off-Broadway play, and now thanks to This American Life producer Ira Glass, that play has been turned into a movie. Glass' involvement seems appropriate, as the humor here is very much in the realm of “public radio humor”. In other words, it's kind of cerebral and geared towards the artsy crowd, and you won't laugh so much as smile and think to yourself, “now that's clever.” Nothing wrong with that, just don't expect to laugh out loud too many times. The film is a bit slow at first, only really hitting its stride about halfway through when Matt leaves his job as a bartender (and the pressure of having to deal with his girlfriend one-on-one) to go on the road and perform in various seedy, low paying gigs. This is when his creativity starts to blossom, and also when his sleep disorder becomes more of a problem. There are times when it's difficult to like Matt/Mike, but at the very least he's always an intriguing figure. Plus you kinda' have to give the guy credit for painting such a warts and all portrait of himself. Cinematically speaking, this is pretty basic filmmaking. Nothing about SLEEPWALK WITH ME is particularly striking in a visual sense, and the heavy doses of narration very much belie the film's origins as a one man stage show. Perhaps a concert film format that simply recorded that show would have been as good if not better, but what we have here is still honest and entertaining enough to warrant a view. 2 1/2 out of 4 stars.